This first title of Onivers leads you through a labyrinth. Will you walk through the rooms of dreams, hoping that luck will reveal the doors, or will you prefer to spend a little more time in each room? In any case, you will face the nightmares that haunt the corridors of the labyrinth. 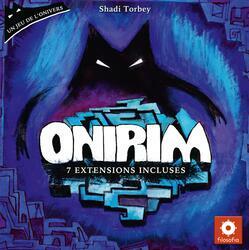 Onirim is a solitaire and cooperative card game where the player (s) must defeat the game and collect the cards before the draw draws!